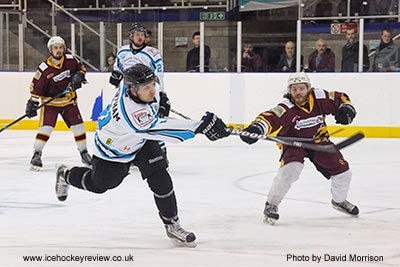 Blackburn Hawks extended their lead at the top of the Moralee Conference on Saturday night with an 8-1 win over Sutton Sting. They are now 5 points ahead of second placed Billingham Stars - who did not have a league game - albeit having played one game. Sheffield Spartans moved up to 3rd place in the table after a 10-4 win away at bottom club Manchester Minotaurs, swapping places with Whitley Warriors who lost 5-2 away at Solway Sharks.